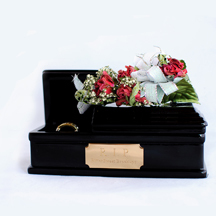 The Wedding Ring Coffin is made of solid wood and has a dark glossy mahogany finish. The coffin measures 6 1/4″ long x 2 1/4″ wide x 2 3/8″ high . The interior is lined with black velvet and includes a ring insert to comfortably and securely hold your wedding ring. its proper, final resting place. The Wedding Ring Coffin is the perfect gift for yourself or a loved one for bringing closure after a divorce. It’s time to bury the past and move on to a new tomorrow.